In This Episode: Feel-good stories can go viral online, but let’s apply the Uncommon Sense filter and see what we can take away long after the viral story is forgotten. The “princess bride” and the princess-loving girl. The photo: click to see larger. There’s a reference at the end to Episode 2, which is worth a listen if you didn’t catch that one. Yes, someone set up a GoFundMe to supposedly aid the girl, but see the first comment below: I’m very suspicious of the motives. In these acrimonious times, a feel-good story can easily go viral online, getting shared on social media, then sometimes even picked up in the news media, which is then shared on social media again. I’m going to tell you one of those stories that you might have seen recently, but then I’m going to look at it from another angle, using the Uncommon Sense filter to see what we can take away for the longer term, after the viral story is forgotten. I’m Randy Cassingham, welcome to Uncommon Sense. If you frequent social media, you probably at least saw the tease for this story, and may well have clicked on it. I’ll start with the details of what happened, including some you may not have seen in whatever writeup you happened to read, and then delve a little into what makes this a story of Uncommon Sense. It happened in Akron, New York, a town of less than 3,000 people in the western part of the state between Rochester and Buffalo. There, Caleb and Olivia Spark had just gotten married, and they went to a park with a photographer for their wedding pictures. As the wedding party was posing for the various shots, someone else in the park noticed the commotion that Saturday afternoon: Layla Lester, a 5-year-old girl. Layla is autistic, and her mother says she often doesn’t know how to interact with people, especially strangers. But when Layla saw Olivia Spark in her wedding dress, she immediately knew who it was — definitely not a stranger. “She just goes running over, arms wide open,” said her mother, Jessica, yelling, “Cinderella! Cinderella!” Jessica said later that, “When she sees a princess, she’s going to love them because she loves princesses.” Mom says Layla knows of princesses from (where else?) Disney movies. Of course, the girl also saw the princess’s entourage — her wedding party — and figured one bridesmaid was Ariel, and another was Belle, her mother said. The man in the nice suit? Well obviously, that was Prince Charming! 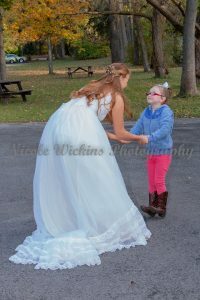 And yes, photographer Nicole Wickins shot photos of the encounter between the little girl and the princess bride, and even a short video, which really made the encounter a perfect online viral sensation. I have one of the photos on the Show Page if you missed all of the 30-million online postings, though that’s probably …inconceivable. Well, an appeal to help a little girl? Naturally the story spread quickly online. Well, I already gave it away since I’ve told you the little Buttercup’s name, and the mother’s name. Plus, Akron, New York, is a small town; the wedding couple quickly got the family’s contact information. Even that is an “Awwww!” moment: Olivia set up the meeting back in the park with a special carriage to meet in: a pumpkin-themed carriage, just like Cinderella rode in. And brought the photographer for that encounter, too. Wickins was sure to get the mother’s permission to share the photos online, starting the second wave of viral sharing. OK, sure: that’s a sweet, sweet story. But how is it an example of Uncommon Sense? Olivia could have been stressed: it was her wedding day. She and her new husband were trying to get their pictures done and get to their reception where their guests were waiting. And Olivia might have been worried about the professional photographer being on the clock. But she wasn’t. This out-of-the-blue surreal situation was dropped on her during what was already a very out-of-the-ordinary day. Have you watched someone in the middle of something intense get interrupted? It’s not at all unusual for them to be irritated, even angry. “Bugger off, kid, yer bothering me!” None of that for newlywed Olivia Spark: she didn’t just keep her cool, she rolled with it and created a sweet lifetime-long memory not just for the autistic Layla, but for herself, her new husband, the photographer, and the entire wedding party. And the girl’s mother, and anyone else who happened to catch this scene. And, frankly, tens of millions of people who read the brief story in a social media post, saw it in the news, or are learning about it from this podcast. And it’s all because she made a quick decision to break off from her important business to tend to a little girl’s unimportant business. Then she thought of getting copies of the photos to the girl, and making that a magical moment too. Yep, that’s all definitely a great show of Uncommon Sense by Olivia. It’s exactly what I was talking about in Episode 2: “You never know who is watching, and learning, from the example you set…. Your actions — positive or negative — could reverberate for decades.” Olivia’s actions definitely will. I hope you’ll agree that it’s worth the time to exercise Uncommon Sense. It takes just a split second to think, rather than react with irritation or anger. Isn’t that exactly what we think of when we use the phrase, “Decent human being”? By taking that split second sometime, what magical moment could you create for someone — or even yourself? Or maybe even millions? Keep your eyes open, because it could happen anytime, anywhere. …and the bride has even set up a GoFundMe to help send Layla to Disney World to meet ALL the princesses. I did see this story and found it as moving as you illustrate here. I did not see the Go Fund Me page news. That is awful that some stranger is profiteering from this magical moment. My bet is the little girl and her family never see a dime. Shame on the one responsible for that cheat. Miss Lester was right. Mrs. Spark is a Princess, in the best sense of the word. Random act of kindness… charming to behold. “Inconceivable,” ha ha! Thank you for the subtle references to The Princess Bride woven throughout this story. I sure hope little Miss Jessica has seen that movie, too. Although, the ROUSes were kind of scary.